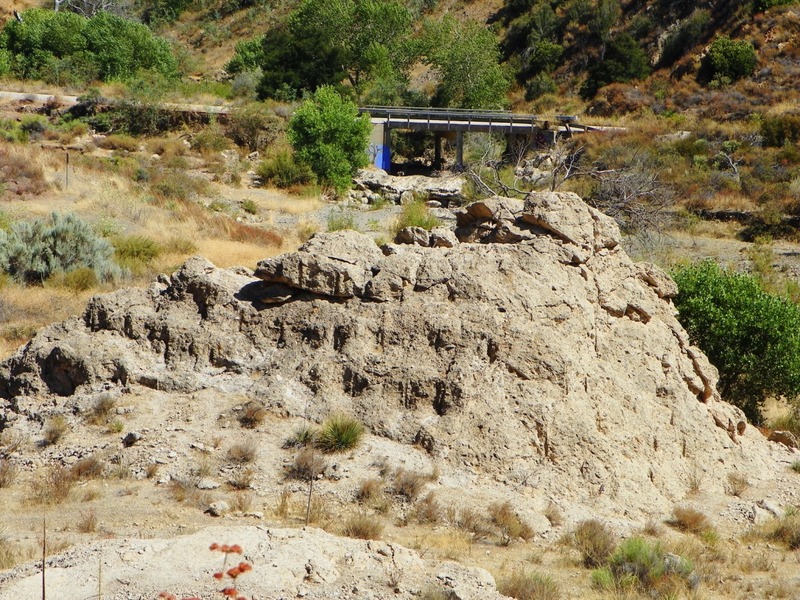 First is the google image of the site (above), and a wider view of the outcrop (below). One thing that stands out about the San Gabriel Mountains is the extreme steepness of the terrain. As I have noted several times (here, for instance), the only flat places are on river floodplains or the tops of landslides. 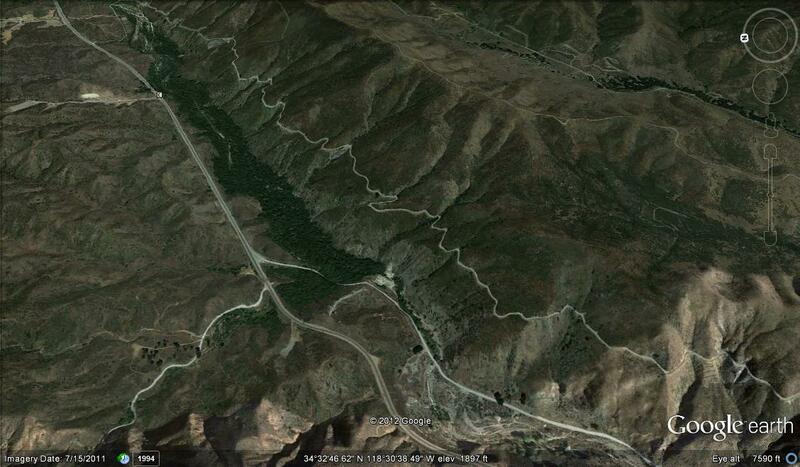 That makes the green thicket of trees on the upper left of the GoogleEarth image immediately interesting. Why are the trees there, but not in other parts of the canyon floor? The second thing to note is the constriction in the canyon on the downstream side of the floodplain forest. Why is it there? The third feature is the linear nature of the canyon itself. Streams tend to erode sinuous gorges unless the underlying geology (i.e., weak, easily eroded rock) is guiding the direction of the river carving. Why is that canyon so straight? Here is the context shot. The dark oak tree in the upper left can be seen in the GoogleEarth image in the lower center as a dark dot where the canyon widens just downstream of the forest. The "outcrop" lies in the midst of the wider floodplain at the very bottom of the satellite image. The linear canyon is rather adequately explained by the presence of a fault juxtaposing two kinds of rock. 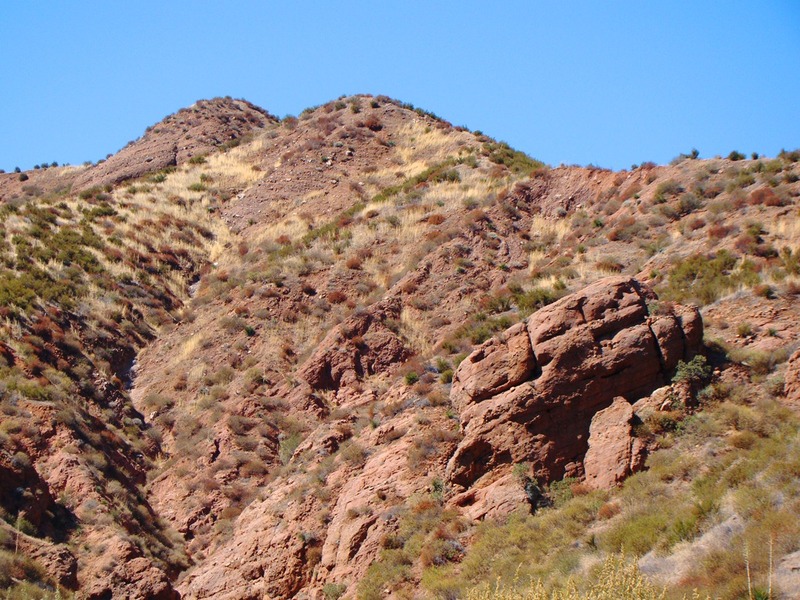 The rock on the west side (below) is an Oligocene terrestrial conglomerate-sandstone called the Vasquez Formation (known also as the Sespe Formation). Here is a final context shot for the mystery (below). The story is perhaps becoming clearer: the San Gabriel Mountains have been rapidly uplifted, so that even weak rocks have been deeply eroded and formed steep slopes. Fault lines cross the mountains, including this locality, so the canyon eroded in a straight line that divided the Vasquez Formation from the Pelona Schist. 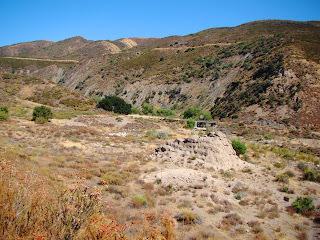 The Pelona is prone to slope failure, so ancient landslides blocked the stream, forming temporary lakes that filled with sediment, providing a nice environment for the growth of a riparian forest. 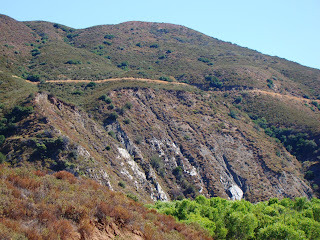 The constriction in the canyon is the site of the old landslide. All of which doesn't exactly provide an answer to yesterday's mystery. Many commenters (who never cease to amaze me with their insight) suggested the idea of a debris flow, and this is correct in a way. 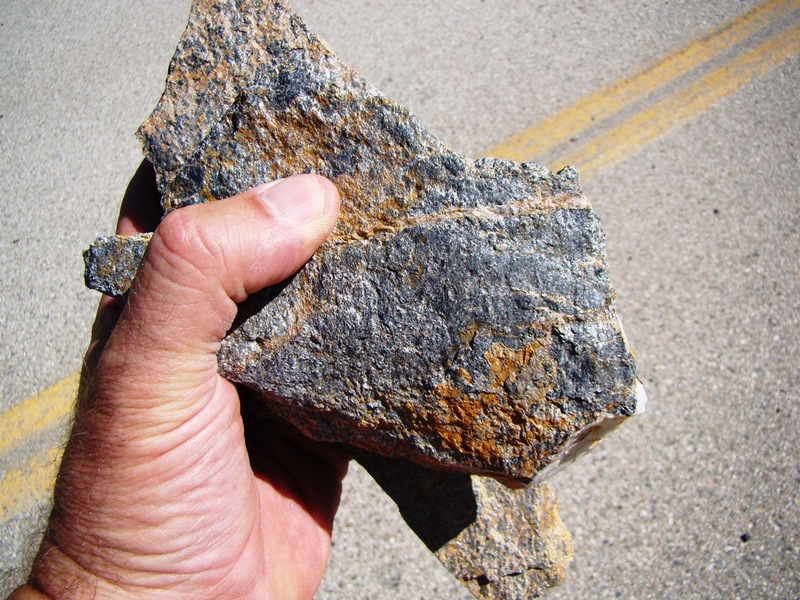 Others noted the regular pattern of holes and suggested that the outcrop has been quarried or otherwise altered by people. Also true, in a way. The next post may be titled "They didn't. Surely they didn't put it there..."
Oooh! 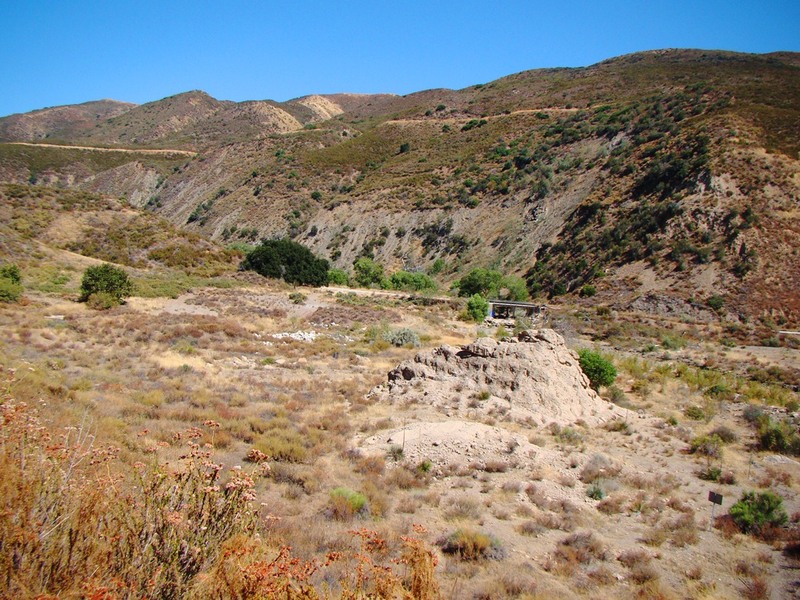 Is it a remnant of the St. Francis Dam?